This case study illustrates the value of divorce financial planning as a means of attaining a truly equitable and fair TN divorce settlement. Most TN divorces are missing these types of financial insights. Studies have shown that the financial ramifications of divorce are the fourth most frequent reason cited for bankruptcy in this country. Don’t become a statistic. Take the time to understand the numbers before you sign your divorce papers. Secure your future and your children’s future. Don’t just get a TN divorce. Get a financially smart TN divorce. If a spouse put their career on hold or left the career world to care for children this should be considered during settlement discussions. What is their earning potential? How long will they need to work at their first job post-divorce before they can expect to receive a raise or be eligible for a higher paying position? Career counseling helps create realistic expectations. Typically, it is not possible for an individual to transition from being a stay-at-home parent to becoming financially independent overnight. If minor children are at home, the work schedules for both parents may be impacted and reduce their ability to earn income. Additionally, the settlement needs to ensure that both spouses understand the long-term implications of the proposed settlement and potential impact on the family. Refer to the case study on this page to understand why a 50/50 division of assets is not always fair and equitable. David and Susan are 45 years old and have two children. They own a Nashville home worth $360,000 with $180,000 of equity. David earns $90,000-per-year and Susan has a part-time job where she earns $20,000-per-year. Their retirement plans have a total of $250,000 in value. In addition, they have cash and investments (stocks) worth $130,000. David proposes that Susan keep the house with $180,000 equity, $50,000 in cash/investments and $50,000 of David’s retirement account. David will keep $80,000 of the cash/investments and $200,000 of his retirement account. David will pay $1,500-a-month alimony for 3 years and $750-a-month in child support. All assets are equally divided and this appears to be a fair and equitable TN settlement. 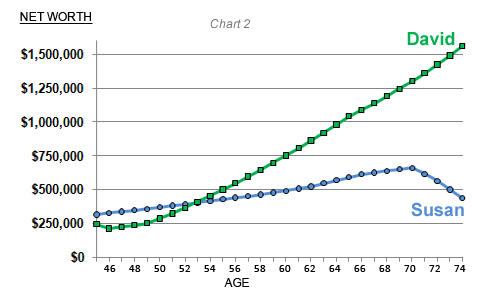 However, a financial analysis creates the financial future illustrated in the graph below. After viewing the simulation, Susan and David understood the long-term financial impact of the proposed divorce settlement. Keeping the house would be financially devastating for Susan. The large mortgage payment, utilities, and maintenance costs would keep her monthly living expenses so high that even with alimony and child support she would still spend more than she makes every month. Susan understood that keeping the house would require her to sell her investments, use her retirement funds and borrow money to make ends meet. The simulation illustrates if Susan keeps the marital residence, ten years after her divorce, she will have spent all her investments, retirement funds AND have a net worth of $0. Susan understood why she cannot afford to stay in the marital home and why she should sell the house and purchase a home she could afford. Susan also realized that she needed to have a plan to increase her income long-term. She needed a career, not just a job, to become financially independent post-divorce. After some soul searching and research, Susan decided she would need two years of education for her to enter the job market with essential skills. After viewing the computer model, Susan and David could make informed choices. They realized that a different 50/50 division of the assets as shown below provided a win-win. With this division of assets, Susan will be able to purchase a home she can afford and also add to her retirement funds. Her future is more secure. The computer model also helped David understand how Susan could benefit if alimony was extended two years and why the extension was necessary. 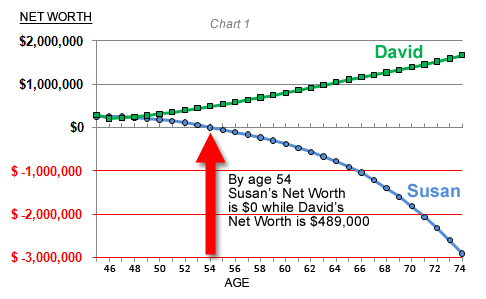 Chart–2 below shows how the final offer provides a better solution for Susan, David and their children. David’s alimony payments will be tax deductible, so his real cost is $1,125 per month. Understanding this fact made the payments acceptable to David. During the marriage, David was able to focus on his career while Susan took care of the children. This increased David’s earning potential which will allow him to recoup his alimony payments over time. David will still have a monthly surplus which he can save. If he stays on budget and invests wisely, his investments have the capacity to grow to $1.6 million by the time he retires. Because Susan and David understood the financial impact of the proposed settlements, they each realized why compromise from the initial settlement was necessary. This knowledge reduced arguing. Less arguing resulted in less stress for the family and lower legal fees. Arons & Associates Divorce Planning would like to show you the potential short- and long-term impacts of proposed division of marital assets you may be considering (including the effect of alimony/child support payments). Contact us if you’d like more information on how we can help you get a fair settlement and a financially smart TN divorce. While we don’t agree on everything, we do agree that Sandy’s assistance during our divorce process was invaluable. Despite the fact that we both had an attorney, we did not feel comfortable moving forward with the proposed divorce settlement until Sandy had reviewed it and given us feedback. She consistently brought issues to our attention that we had not considered and saved us from making some potentially dreadful financial mistakes. Her ability to speak candidly regarding divorce financial issues helped us both realize when were being stubborn and needed to compromise. If divorce is in your future, see Sandy before you begin the legal process. You’ll get more value from your legal fees and minimize unnecessary emotional stress for you and your kids. Lost your way on the Divorce Interstate? 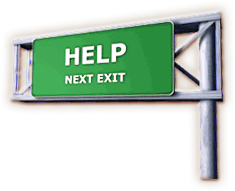 Take the next exit and stop by our office. Thank you, Arons and Associates, for helping my family get a financially smart divorce. Your services reduced conflict, unneccessary attorney fees, and gave us confidence we were making smart choices. 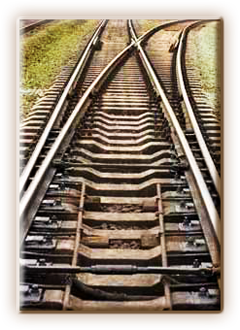 Does your financial plan provide sufficient funding so you are on-track today AND tomorrow? Additional recommended reading suggestions from Arons & Associates. 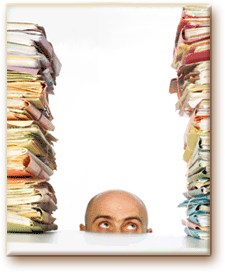 Feeling overwhelmed with divorce paperwork? DivorceCare groups are designed so you can begin attending on any week. The classes are free and offered by a number of local churches. They provide very useful information. Public and private schools also offer free counseling for your children. Do you think that financial matters are as mysterious as an abacus? We can explain the issues so you understand the financials and make INFORMED decisions.